We have addressed a number of questions frequently asked by staff who may be moving into the hub as providers. Please click here for more information. Here you will find answers to general questions about the project that we frequently encounter. Answers are based on knowledge that we gained during planning for the prototype hub. If you are interested in answers to questions frequently asked by staff who may be moving into the hubs, please click the link above. If your question is not answered here, please feel free to reach out to us by visiting our Contact Us page. More FAQs to come as the project’s work progresses. (1) What is the ISS Project intended to accomplish? The Integrated Support Services project is an effort to design and implement an administrative structure that provides excellence across UWM, focusing on the functions of Finance & Accounting, Procurement, Human Resources, and Information Technology. Among other goals, it is intended to accomplish long-term service efficiencies’, increase effectiveness, make better use of technology, and enhance professional development opportunities in administrative areas. 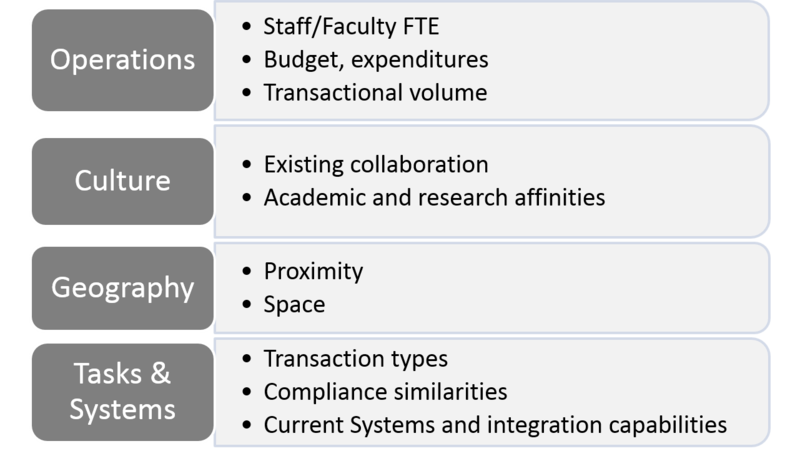 Among other things, it is expected to reduce costs through simplification and standardization, concentrate resources on higher core value activities, improve the quality of service to the academic and administrative units, improve response to organizational changes, and facilitate technology deployment. For a comprehensive list of benefits, please visit the About Us page on the ISSP website. (2) Does the proposed model save UWM money? How? Staff turnover and budget cuts have created lean staffing situations for administrative functions across the campus. The model takes into account scalability of services and process improvement changes that will be beneficial. This is also intended to reduce exposure to risk. (3) Will the project recognize the importance of staff who perform transactions in the planning and decision-making process? Yes. The project’s Functional Teams understand that employees that perform the functions and process transactions may know the most about how individual processes really work, and how best to improve upon them. The Functional Teams will be consulting with individuals at all levels of the institution and all stages of the project. (4) Many employees perform multiple functions for a unit; some in the four functions of the project and some outside of them. How will this be taken into account? While at this time it is too early to know exactly how everything will be designed, we will have a thorough understanding of who performs what functions on campus, how other duties are distributed, and the possible impact of changes. It is the objective of the ISSP to make administrative processes more efficient and effective without negatively affecting other functions outside the scope of the project. (5) What will happen to existing staff? Some existing staff will be transitioned into the Shared Services Center while others will remain in their schools/colleges/divisions. Affected staff will participate in planning for transition. We will analyze skill sets and interests to determine staff assignments, develop transition plans for activities in and out of scope for ISS, and assist with process improvement efforts. After transitioning to their new roles, staff will have clear roles, responsibilities, and reporting lines, in addition to training and development. 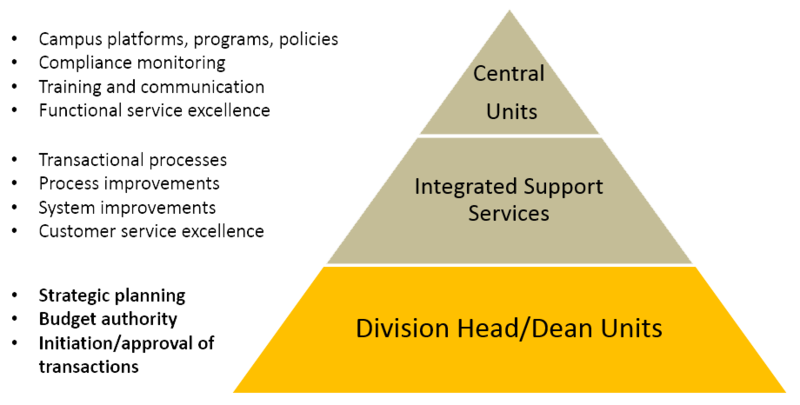 (6) How do Deans, Division Heads and other leaders keep critical strategic or other support roles in their units? It is expected that Deans and Division Heads will retain professional staff currently serving in critical strategic roles. Responsibilities may include budget planning and development, strategic planning, providing administrative support for academic programs, and organizational planning. Roles may include participation on a team within the Service Excellence and Accountability Structure, facilitation of communication and planning with ISS, and approval of transactions executed by ISS. (7) What will happen with the central units and central unit leaders? (8) How will the Hubs be decided? Please see the Hub Alignment & Prototype Decision for more details. (9) How many staff are in the prototype Shared Services Center and Campus Technology Services (CTS)? Including the Manager, there are 17 staff in the prototype Shared Services Center. The staff are providing a myriad of HR services and a focused set of procurement and e-reimbursement services are coming on-line from February through July, 2019. Of the 17 staff, 13 came from the supported schools/colleges/divisions and 4 came from the Central Human Resources Office. Campus Technology Support (CTS), the shared services organization providing IT support, contains 32 staff. Of the 32 staff, 16 came from the supported schools/colleges/divisions and 16 came from University Information Technology Services (UITS). CTS staff provide comprehensive computing support through the Help Desk, Classroom Services, Desktop Support, and Technical Engineering teams. (10) What will happen to existing business processes? Existing business processes have been reviewed, redesigned, and improved, and changes implemented for efficiency and effectiveness. To the greatest extent possible, they are standardized and measured against performance metrics. A structured Service Excellence and Accountability Structure will provide ongoing assessment of processes and support for continuous improvement. (11) Why does the plan include reorganization? Can we just improve processes and get the same results? (12) What activities will stay in the units and how will that work be covered? (13) Has the project team done research in similar implementations at peer educational institutions? Is it incorporating any lessons learned into its planning effort? For more examples, please see the Models page on the ISSP website. (14) What lessons have been learned from the prototype Shared Services Center and CTS? The ability of staff to adjust to changing processes, supervisors and physical locations is impressive. There are optimal times of year to bring up a shared services center and less optimal times to do so. Having service providers in close proximity allows for new ideas to emerge and be implemented. This brings about process refinement and improvement. Having physical proximity to central office expertise assists in a smooth transition and deeper subject matter expertise for all service providers. (15) Is the project team doing research in similar implementations in the private sector? Is it incorporating any lessons learned into the planning effort? Yes and yes. Although our focus has been on shared services initiatives in higher education, the Project team has also researched the data from private industry. (16) How is the project related to shared services initiatives that are underway on an ad hoc basis within various campus divisions and departments at this time? The Project Team understands that UWM divisions and departments are currently exploring ways to share resources to create savings. While these efforts are not part of the ISS Project, they will serve to inform the ongoing planning. We will endeavor to stay informed about these initiatives and consider their implications for final recommendations. (17) How will it be determined if the project has been successful? The Project will use metrics to set and meet process excellence and service delivery targets. The prototype SSC and CTS are utilizing an Operational Advisory Council for continuous feedback. The OAC is predominantly Associate Deans and other leaders from the schools/colleges/divisions being served. (18) How will you ensure service excellence? (19) What kind of communications are planned? Since June 2015, the project leadership has been making numerous campus presentations to stakeholders and governance groups. Updates are also provided via email, campus announcements, and via the ISSP website. The ISS Project Stakeholder Communication Plan outlines stakeholder groups and types of communication for each group. Please monitor the Stakeholder Communication Updates page for ongoing updates. (20) How can someone learn more or provide input to the Project Team? Use the Contact Us page on the ISSP website to offer suggestions, ask questions, or request further explanations.